FAQ – Prairie Flax Products Inc. WHICH IS BETTER FOR ME, WHOLE OR GROUND FLAX SEED? WHAT IS THE DIFFERENCE BETWEEN BROWN, GOLDEN OR YELLOW? HOW SHOULD I STORE FLAX SEED AND FOR HOW LONG WILL IT KEEP? I’M TAKING A PRESCRIPTION MEDICATION. CAN I STILL EAT FLAX? HOW MANY CALORIES ARE IN FLAX SEED? 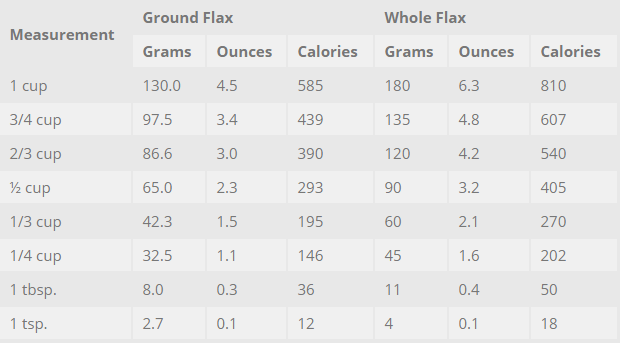 WEIGHT AND CALORIE OF FLAX SEED PER SPECIFIC MEASUREMENT? GOLDEN VS BROWN FLAX, WHICH IS BETTER? Ground flax seed provides more nutritional benefits than does whole seed. That’s because flax seeds are very hard, making them difficult to crack, even with careful chewing. Grinding flax seeds breaks them up, making them easier to digest when eaten. Then the body can profit from all that flax goodness. If whole flax seeds remain unbroken, they may pass undigested through the body, reducing the nutritional advantage of eating flax seed in the first place. What is the difference between brown flax seed and golden or yellow flax seed? Is one better than the other? No, one flax seed is not better for you than another. Brown flax seeds provide the same nutritional benefits as golden (or yellow) ones. Both brown and golden flax seeds have plenty of lignans and dietary fibre, and both contain more than 50 per cent alpha-linolenic acid, an essential fatty acid that is critical to overall health and wellness. While some people prefer yellow-coloured seed in their cooking, brown flax seeds add the same nutrition to your diet as do golden ones. This means you can choose your flax seed freely. Brown flax seed may be more commonly found than golden, as more brown than golden flax seed is grown commercially. Note: There is another yellow seed that looks like flax, but is not flax. It is most likely solin seed, a crop developed from flax. Solin seeds do NOT provide the same nutritional benefit of flax seeds. Solin seeds contain less than one-tenth of the alpha-linolenic acid found in flax seeds. Thus, the important omega-3 advantage of flax is missing in solin. Whole flax seed comes with Nature’s own finest packaging – its natural hard hull keeps it fresh. You can store clean, dry, good quality whole flax seed at room temperature for up to a year. Some people keep a jar of flax seed handy on their kitchen counter. All vegetable oil products require some care in handling and storing. You should refrigerate it in an airtight, opaque container. Ground flax seed handled this way will keep for up to 90 days. I’m currently taking a prescription medication. Can I still eat flax? If you are taking any medications, we do not recommend that you eat flax or flax products without the specific approval of your physician. This is in keeping with the advice of experts who advise patients to consult their physicians before making any changes to their diet. Although flaxseed is an ancient crop, the increasing interest as a health food has many consumers asking; Which is better, gold or brown. Prairie Flax Products sells both brown and gold. With no preference as to which we sell, this is our answer. Gold and brown flaxseed have very similar nutritional content (oil, lignin and fiber content). Some variances can be attributed to local growing conditions and will naturally vary from year to year. The most significant difference between the two types is the amount of Omega-3 fatty acid found in the oil. Brown typically has more (averaging 59%) compared to gold (averaging 51%)*. So brown is better? WAIT! Another thing to consider is the amount you consume. If you’re aiming for 1 tablespoon of flax consumption per day, you don’t have to increase that amount by much to get the same nutrition from gold compared to brown. If you have fussy eaters who don’t like the look of brown flax, buying golden flax would be a wise choice. Gold is more common in the snack food market for various reasons with the major reason being more appealing with other ingredients. This is why you will find golden flax more available in its whole form instead of ground. Ground brown flax is usually more readily available. 2019 © Prairie Flax Products Inc. Crafted by Cloud Studio.